I went to Lisbon, Portugal with a goal to find and to buy the perfect art piece as a memento from my travels there. I wish I could provide a coherent explanation as for what constitutes ‘perfect’ art; it is a personalized perfection, per se, because no two people will see a work of art with the same lens. How neat is that? That one person could be totally captivated by a piece while another is repulsed? Same property applies to other art forms (e.g. books—literary arts. One prominent example that comes to mind is The Catcher in the Rye by J.D. Salinger. Some people could not stand it. I loved it.) Good art is the artist’s ability to inspire a strong enough feeling from you to shift you from your normal resting state, whether you like it or do not like it. What makes art good is its capacity to fill someone with the urge to do or feel something your usual thinking/feelings. Art has the flexibility to be whatever the viewer sees it to be. Maybe art harnesses an idea that links to our past or an idea for which we hope in our future, like a subliminal connection to the work, and for that reason, we develop our taste for art. Maybe we are drawn to art because of a natural force that we experience when we are drawn to anything else, like “chemistry.” As for me personally, I like the magic of thinking our attraction is more of a niche. Thanks for reading that mindwander*. Now, onto the my short story that catalyzed this reflection. On my ascent to explore the São Jorge Castle, I put on those imaginary shopping goggles you wear when you are looking for only one item in particular so you don’t drain your wallet…because everything is so cool. In my case, my goggles were tinted for an art piece that showed personalized perfection. So as I climb, I pass many art stands. The second stand: Further on the route sits a focused young woman who paints to pass time on a Saturday afternoon. I like the idea of her, but her art is basic. To me, the art on display lacks the unique flavor that artists pour into their work to distinguish theirs from any other work of the same subject. The third stand: I reach a populated overlook of the city about halfway up the hill where I encounter a woman on her phone with headphones selling reprints of artwork. This feels phony to me. Copies?? No. I could go to kinko’s and make a copy myself. Give me that fresh, original piece that I won’t find anywhere else in the world. And then. Through my shopping goggles, I see the perfect art. Last stand: a tiny art station sits lodged in the corner of the platform and I am immediately captivated. Meet the artist Eduardo Roberto. Oh wait, excuse me, the “one and only Eduardo Rrrrrroberto” as he introduces himself. What a treat he is. He is friendly yet focused in his work. 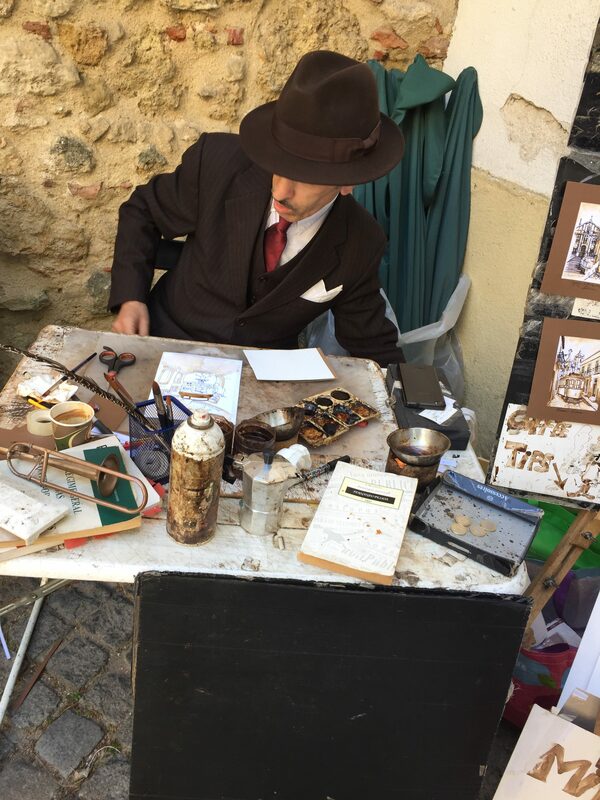 What I notice is that all his paintings are brown…it smells like coffee…on the table, there is coffee…a cup for drinking…two cups for drinking?…he dips his brush in coffee and he works on a piece for his display board right in front of me… Besides drinking coffee, he paints with coffee! This niche style and charisma inspires that change in feeling I mentioned in my reflection. This is definitely the one. P.S. To further capitalize his already notable originality, he encloses my painting in brown paper and signs the wrapping with a sketch of a cartoon self portrait…a remarkably accurate representation of his character: animated and original. *mindwander: a made-up word in my personal dictionary that means a leisurely or aimless way of thinking or explaining an existential concept as a result of overwhelming inspiration that is enough in the boundaries of the topic to not be considered a tangent. Basically, arts, ink is the platform for writing all of my mindwanders. Hello arts, ink readers! Writing to you from across the Atlantic where I am enrolled in a University of Michigan study abroad program in southern Spain. I’m thrilled to share some of the cool experiences I have had in the borderless world of creativity. No matter where in the world you are or what language you speak, there is art. Art is language that we can all understand. One event that I had to pleasure of seeing was the choreography of Love Chapter 2 by L-E-V Company at the Teatro Alhambra in Granada where hundreds of people gather on Calle Molinos to watch international phenomenons. L-E-V Company is an Israeli dance and spectacle ensemble created by dancer Sharon Eyal and designer of multimedia events Gai Behar. So, the lights dim, the curtain opens, silence falls over the audience, and a steady, isolated beat commences. Six dancers appear, both men and women dressed in fitted leotards colored by a muted greenish-gray tone, and they use this steady beat as a pulse to their every movement. Their solid figures remind me of dynamic sculptures because of their evidently large mass and capacity to stay perfectly balanced no matter how their bodies moved. Their godlilke muscles are traced by the subtle overhead lights. There is a only small, selective emphasis by light techniques since the dance itself is quite elaborate and any extra effects would distract from the pure intensity of the dancers. The single rhythm as well as the movements slowly evolve to demonstrate the feelings of love. The music has an important role in the message of Love Chapter 2. It begins simply yet mysteriously with only a drum, like when you first encounter someone or something intriguing. From that point, new sounds are layered one-by-one until the music becomes an organized web of sounds. The increasing complexity of the music mimics the increasing complexity of the dance to represent when love changes into something more intricate and more exciting as you come to know someone. Then, we see passion. This style of dance is unlike anything I have seen before. The dancers move in ways that challenge what I had imagined possible while they somehow maintain elegance in a wholistic manner, every feeling is written clearly across the dancer’s faces and throughout their entire disposition. Though they all perform the same routine, each dancer expresses his or her own slightly unique interpretation. That’s to say while there is synchrony, it is not the robotic synchrony that seems mechanical, but rather shows character and humanness…an attribute to the nature of love itself. During the show of consistently awe-striking dance, one of the six dancers would break apart from the group’s synchrony and perform his or her own unique movements. That is how the director emphasizes new, strange feelings and also the beauty of love and how each person feels love in their own way. Above all, my favorite part is the moment that the director / choreographer comes to the stage and I see a person behind the magician of the theater. “If you are grateful for where you are, then you have to respect the road that got you there.” A friend showed this quote to me, and I don’t have the original reference. Especially in college, the majority of us feel like we are wandering through life, mapping out where we want to go, but this journey often seems aimless. We may riddle our thoughts with what ifs and I should haves which only harbor uncertainties about our choices. We worry that changes to our past would have been led us to something that “feels right.” This is dangerous thinking, mostly futile actually…since there is nothing you can do to change the past. They are also a little foolish because you are at the University of Michigan! Whatever road you took got you HERE! That’s something to be grateful for. Instead of second guessing, remember where you are. Dismiss regret and move forward. You learned something on your road, so take that knowledge to your next destination. This is Lily. Lily has outsmarted the world. She can do whatever she wants…and be successful. Lily and I met in high school, I knew her to be someone who is fond of music, she was exceptional pianist as well as first chair cello in the high school orchestra. One evening, Lily came to my house to hangout….with a guitar. Lily explains, “I’m teaching myself how to play guitar.” And so she did. Lily spent a year at Kalamazoo College, then transferred to UM the following year. One day, I saw her at the CCRB on the stationary bike with headphones in watching the children’s show Caillou. No question of why. It’s Lily. She’s probably up to something. I took a seat on the bike next to her, and she acknowledged the fact that she’s watching a show for toddlers. “I’m learning Portuguese.” And so she did. Next thing I know I got a Facebook message from Lily indicating that she was traveling in Portugal. Lily had mentioned “I’m interested in studying medicine.” I texted Lily last month to ask if she was free on Friday. She responds, “I’ll be in Uganda, as I am currently in Uganda.” Lily was volunteering with Operation International, a surgery team that provides health care around the world. 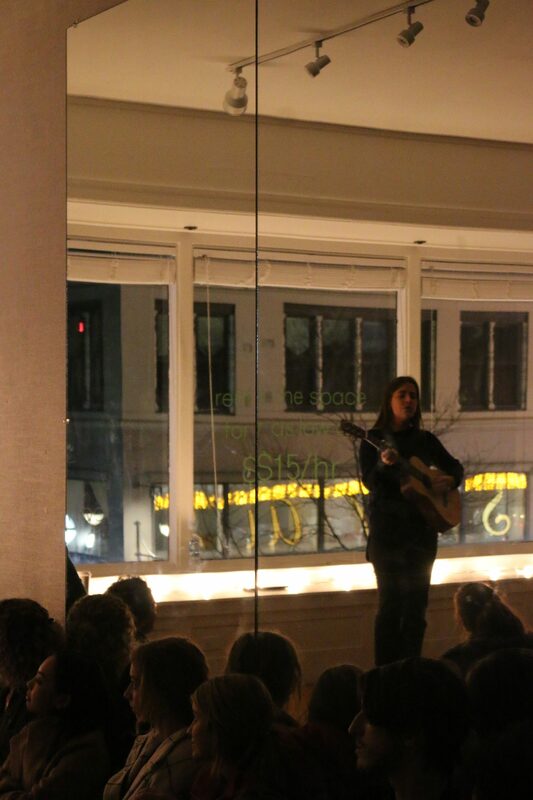 Upon her return to the States, Lily found herself at center stage in front of a small crowd at a newer singer-songwriter venue called Open Floor Studio. From the girl who could roughly play a C chord on the guitar at my house years ago to here in Ann Arbor performing her own original folk songs, Lily is a self taught musical prodigy and self-taught whatever she wants to be. I admire how Lily always has an idea and then will to make it come true. She is a breathing embodiment of Walt Disney’s expression: “If you can dream it, you can do it.” I can’t wait for the rest of the world to meet her. 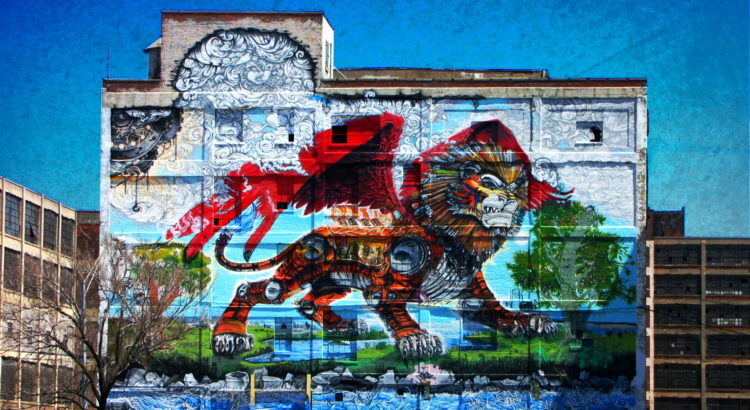 Every time I drive to Detroit, I see this enormous mural but I never knew what was inside. On Friday night, I learned. I bought tickets to see Zendlo, Golf Clap & Malaa perform and the venue listed “Russell Industrial Center at 1600 Clay Street, Detroit Michigan.” I googled the location and honestly I was a little skeptical. I have been to many concerts, but never a concert at this place. So my companion and I drive into a regulated parking system and find ourselves into the closed in center lot between the towering structures of the Russell. It is dark and unfamiliar. There is a water tower stacked on the very top of the building. We peer through the windows and see giant empty spaces. We follow the sound of the music to a door illuminated by red and white lights to be greeted by enthusiastic staff and reassuring security. I learn that this place a gathering site that can suit anything from art studios, music studios, galleries, exhibitions, concerts, weddings, motion pictures, and really any creative event. It’s wicked cool how many people also knew to come to this seemingly dilapidated, vacant, broken-glassed industrial building off of Chrysler Freeway for a hub of a variety of arts. By 1am, the cold space had filled with bassheads and house music that made the night feel timeless. And man what a night! You might be able to see the outside, but you can’t judge a place until you know what’s inside. “Hindustani classical music is developed through two interwoven elements: Raga and Tala. Raga is a melodic element and is crafted by improvisation on fixed patterns of ascent and descent. Tala is the rhythmic structure on which the melody is laid.” So to my understanding, Tala is the template to which Raga molds in the artist’s own creative original way. The Strings of India concert this past Friday in Ann Arbor expressed this style of music using the Sarod, a 25 string fretless ethnic instrument, and the Tabla, a membranophone percussion instrument that plays by unique configurations of the palms and fingers and requires constant retuning. 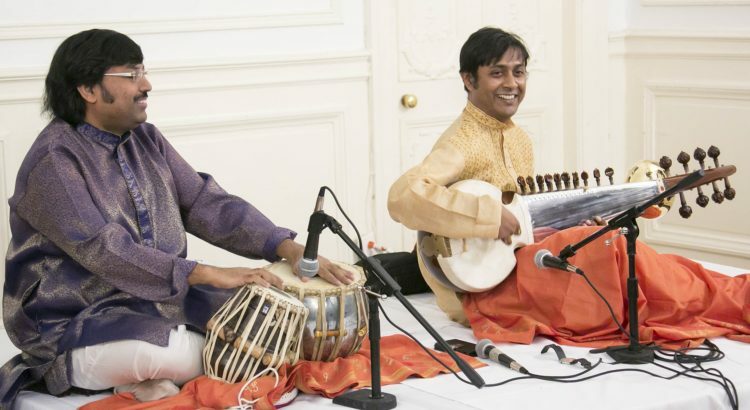 Two artists dressed in traditional Indian attire sat poised at the front of the orange and yellow accented Hussey Room, one with the Sarod and the other with the Tabla. This genre of music was new to me. To be candid, I felt pretty naive hearing this performance. I had no gauge of what was considered good Indian music; I had never listened to it. Basic questions filed through my head. What are these instruments? Well, I could deduce that a 25 string instrument must be difficult to master. Playing my 6 string is hard in itself, and I have frets to measure where the notes are…so imagine more than 4 times the strings on a guitar minus the indications of the notes given by frets and that roughly equates the complexity of the Sarod. The Tabla looks like a simple goatskin circle that generates different sounds depending on where you strike it…so knowing where to strike it to produce the desired output must be quite a feat. How good are these guys on stage? Turns out, the two gentlemen before me were globally recognized as prestigious musicians, and I had hardly understood the magnitude of their talent until this Friday. Apratim Majumdar, the Sarod player, and Amit Kumar Chatterjee, the Tabla player, have very strong, extensive music backgrounds and are prominent in the music world. They have celebrity status in India (I confirmed this with a coworker from India), and after listening to them gain momentum in their performance, their remarkable talent becomes obvious. It’s amazing how different the lives of these musicians are from mine. Their practice focuses on intimate time with just themselves and their instrument. Mine is based in the Ugli, study collaborations, and standardized tests. I wonder how they chose to dedicate their lives to mastering an instrument. I wonder if their interest ever tires after hours and hours of rehearsing. I wonder if there such thing as being the best _______ in the world. Best Sarod player. Best Tabla player. Best surgeon. Best chef. Best employee. Best friend. Is being the best based on statistics…or what? In that case, how can you test music in a statistical way? Maybe by the accuracy of notes…no! Hindustani classical music is improvisation. Thus, there is not a standard correct way to play because there is no script for them to follow. Surgery faces complications in the case of emergency so the surgeon must improvise. If every chef followed the same recipe, all food would taste the same. Chefs improvise. Employees don’t deal with the same exact case every day so they improvise. Every friend is different and so are his or her experiences, so friendship adapts to these changing circumstances by improvising. So how can we grade each other based on a standard when life is improvisation????? I’m thankful to be at a school that fosters my interest to explore the world through art and music in the closeness of the city I call a home, Ann Arbor. Special thanks to SPICMACAY, the Society for Promotion of Indian Classical Music and Culture Amongst Youth. I and crowds of people are able to see performances at the University of Michigan by Indian artists from across the globe for free because of this group’s efforts. Through events like Strings of India, the organization promotes an understanding of the richness and depth of Indian culture and has expanded immensely since its establishment in 1972. Groups like this help make a big world feel small. Here’s a video of one of Apratim Majumdar and Amit Kumar Chatterjee’s performances.